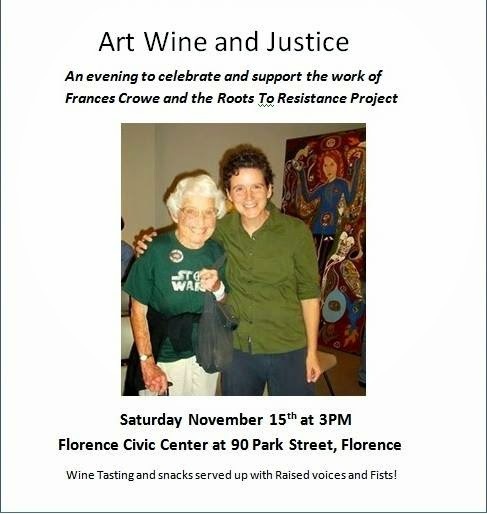 Please join us as we celebrate our campaign for Local Peace and Justice Activist Frances Crowe. Saturday November 15th at the Florence Civic Center 3PM. It will be an amazing afternoon of Art served up with delicious wine offerings, snacks and speakers that will Inform, Incite and Inspire! We are thrilled to have Professor Yasser Munif joining us to speak about his work within the Syrian Revolution, Uprisings in the Middle East and Partnership with Roots To Resistance. It will be an amazing afternoon of Community and Connection!